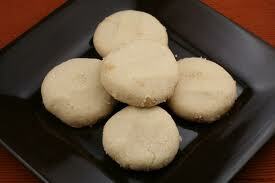 Recipe for Indian Ghee Cookies/Biscuits. A soft, eggless biscuit made with flour, sugar and ghee. Add in ghee gradually and knead lightly to form a soft but firm dough. Shape into small balls. Flatten top slghtly. Place on baking trays and bake in a preheated oven ai 400°F till lightly browned. See Customer Reviews and Compare Bakeware sets . Cool. Store in airtight containers to serve.